Million Dollar Arm With Jon Hamm! In Theaters Now! 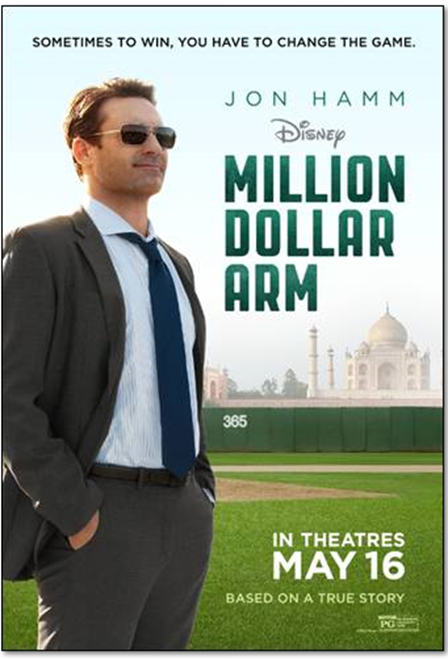 You are here: Home / Sponsored / Million Dollar Arm With Jon Hamm! In Theaters Now! A few weeks ago Hubby and I got to see a pre-screening of Million Dollar Arm! I was so excited about it, we watch Mad Men with Jon Hamm and he stars in this movie, I was looking forward to seeing him in a different role. It’s a Disney film based on a true story, I love Disney and movies based on true stories so this was my kind of movie. The film is about a sports agent whose business is sinking and he needs to find a way to get back on top. So, he and his partner decide they will find the next big thing. They decide to recruit Cricket players from India to play Baseball in America. I don’t want to give away the whole movie, but, I will say it was a great movie. Both Hubby and I enjoyed it very much. The story line was great, the characters were very believable, and the outcome was heartwarming. I especially loved the fact that at the end of the movie they showed some footage of the real life story! The movie comes out May 16th, and I would definitely make plans to see it, it’s a great movie. You can make it a date night or take the entire family, it’s a family friendly movie with no violence or foul language!